Students will be able to identify and spell words in the -ay family. 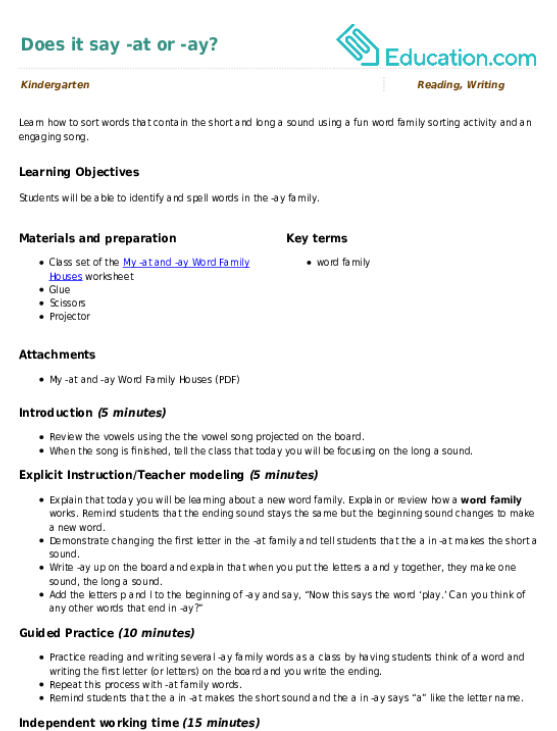 Review the vowels using the the vowel song projected on the board. When the song is finished, tell the class that today you will be focusing on the long a sound. Explain that today you will be learning about a new word family. Explain or review how a Word familyWorks. Remind students that the ending sound stays the same but the beginning sound changes to make a new word. Demonstrate changing the first letter in the -at family and tell students that the a in -at makes the short a sound. Write -ay up on the board and explain that when you put the letters a and y together, they make one sound, the long a sound. Practise reading and writing several -ay family words as a class by having students think of a word and writing the first letter (or letters) on the board and you write the ending. Repeat this process with -at family words. Remind students that the a in -at makes the short sound and the a in -ay says “a” like the letter name. Students will complete the My -at and -ay Word Family Houses worksheet independently. Encourage students to think about additional -ay and -at words to add to their houses. Enrichment: Have advanced students come up with additional -ay and -at words and make a sentence using them. They can also create another word family house if time permits. Support: Invite struggling students to use an index card with -ay and -at written on them and alphabet cards (a, b, c) or beginning blends to change the beginning sound and make new words. Collect the student worksheets and assess whether students were able to accurately sort the words into the correct houses. Ask students to say an -at or -ay family word as their exit ticket before the next activity. Go over the -ay and -at words and write them on class reference charts. Remind students of the short/long vowel sounds and ask them to think of ways they can remember to try both sounds in a word. Say it, Trace it, Write it! With this printable worksheet, your students will practise reading and writing short a words, then have the opportunity to colour! Which does not belong? Ease your child into word families practise with this tricky rhyming sheet. Your students will read each word, trace it, and then write it! 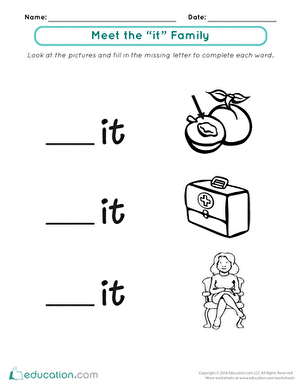 Find the pieces that F-IT with this -IT word family puzzle! Mix up the puzzle pieces and guide your little one in sounding out each letter and letter pair. Introduce your kindergartener to basic spelling with these picture sight words. What does a unicorn and an eagle have in common? A long vowel! Help your students practise sorting the long vowel sounds using this picture sort activity page. Bake a Cake with -ake! What does a cake and a rake have in common? Three letters! Help your students practise reading and sorting -ake family words in this fun cut and paste activity page.